Nice job, Keith! Thanks for sharing! 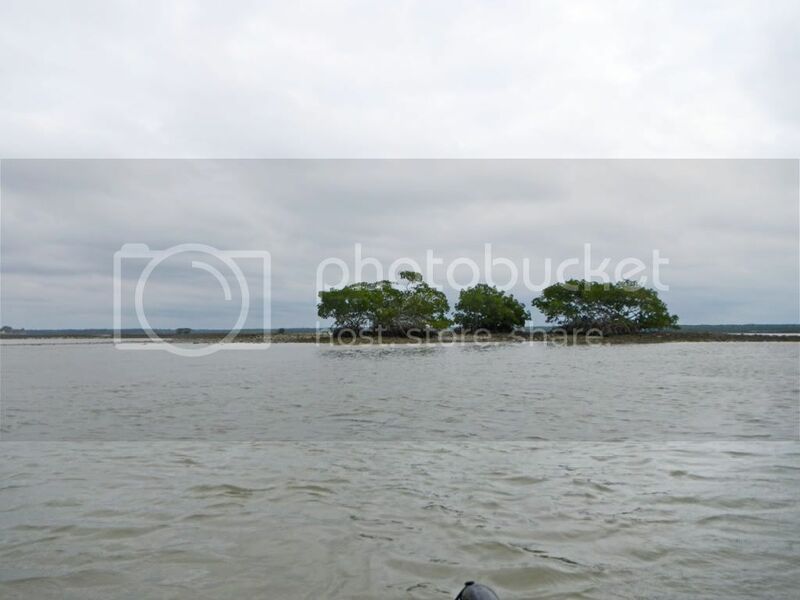 The problem for the new visitor to the Ten Thousand Islands area of the Everglades is that there are no landmarks. As the expression goes, “Everything looks the same!” Probably there are only a few hundred islands rather than 10,000; but that may not be much consolation. This Google image shows the terrain that must be navigated when making a trip from Chokoloskee Island to Pavilion Key (Lat 25.699760 deg, Lon -81.353978 deg.) This is about 25% of the Ten Thousand Islands area. This is my route from Chok to PAV. 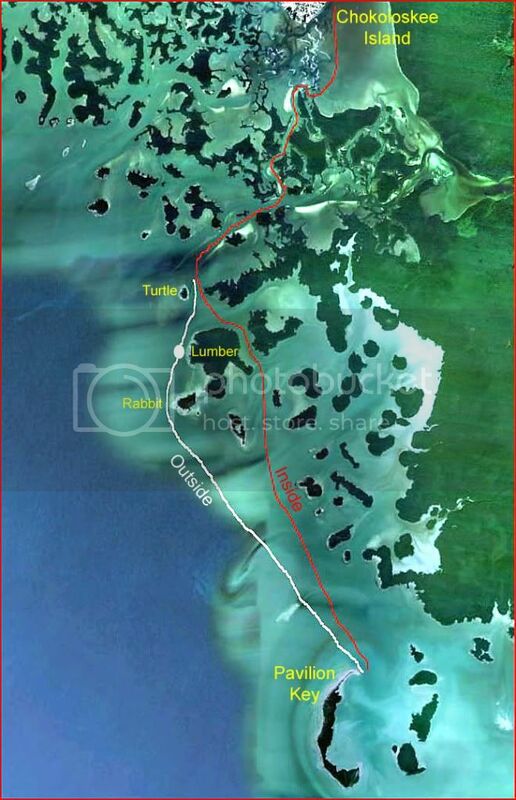 At Turtle Key on our way to PAV, we can go on the inside route (red) to partially avoid rough water on the Gulf. This is also the route we take if we want to do some fishing. We take the outside route (white) to pick up more wind. This is a view on the outside route just after leaving Turtle Key (see dot on previous image for location.) It is the view directly at PAV with Lumber on the left and Rabbit on the right. PAV is about 4.5 mi (7 km) distant. You cannot go between Lumber and Rabbit because there is a serious sand/gravel bar connecting them. In recent years, that barrier has been building. A hurricane in the area could wipe it away overnight, or build it a yard (meter) or 2 higher. 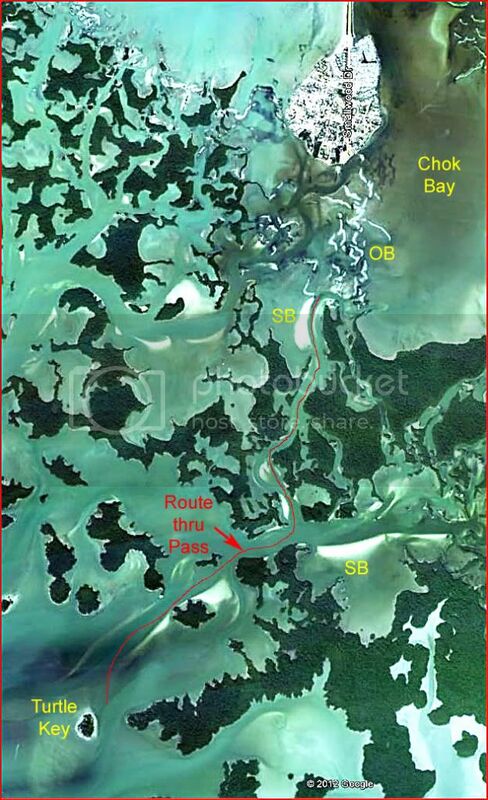 The “pass” through the islands runs from the oyster bars in Chok Bay to Turtle Key, about 3 mi (5 km). Following are a few pictures in the pass. Here is a sand bank. I’m travelling in a channel next to the SB. At “high tide” this SB is 6” to 12” (14-25 cm) under water. The dot shows where the previous picture was taken. This shows one of the many small passages along the main “pass” route. This is a typical view in the pass. Here, the pass makes a sharp left. 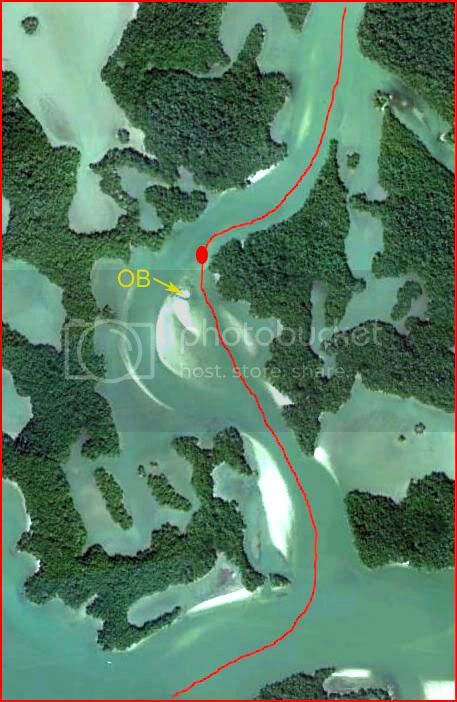 It is quite wide at this turn (about 150 yds), but currents are such that an oyster bar is developing in the middle. A few weeks ago as we moved through this area, we found a hapless power boater stuck high and dry on this OB—and the tide was still falling! He would be there for several hours waiting for the tide to come in to float his boat. He might wait more, 12 hrs more, if the next high tide is insufficient to float his boat. The dot on the Google image shows where the picture was taken. The main channel runs on the other side of this bar. Most power boaters use that channel. 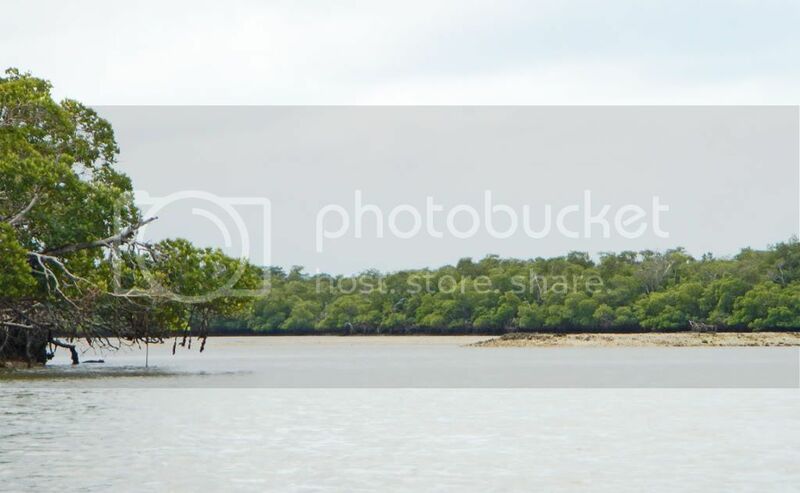 To avoid the high-speed power boaters, I make a sharp left turn before the bar and run along the mangroves on the left. 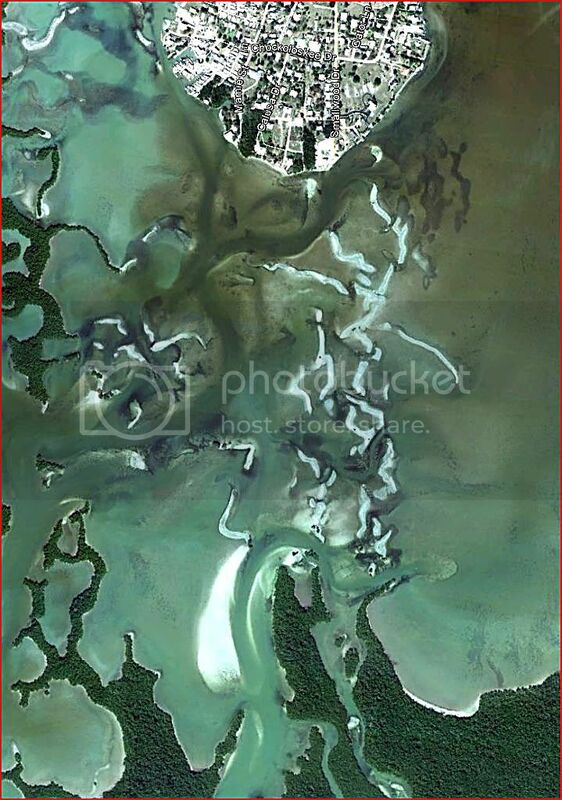 Google Earth image of the oyster bars of Chok Bay. Can you see the channels? My routes through the area. The red line is my preferred AI/TI route because I launch/land from that side of Chok Island. The blue lines are alternatives. The yellow line is the one I like to take in my sea kayak. I love to “run” the oyster bars. 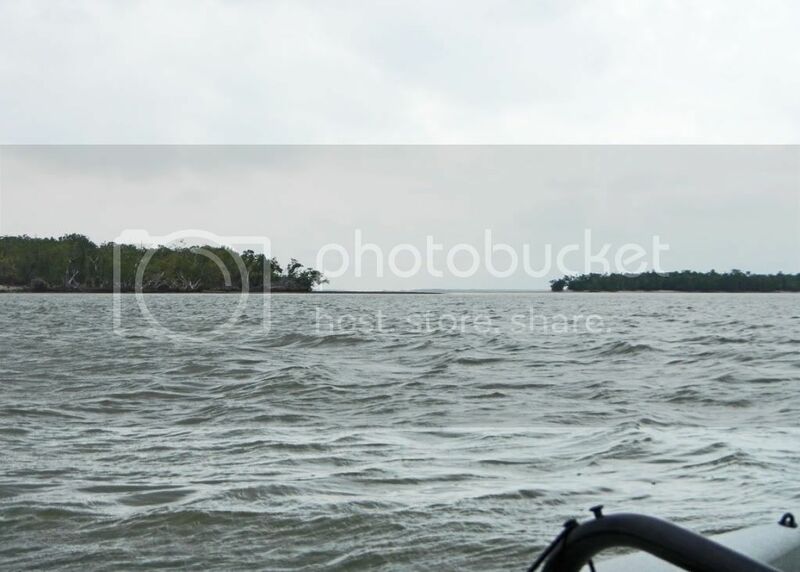 Of course, at water level in a sea kayak, one cannot see that yellow route, so you muddle through as best you can. 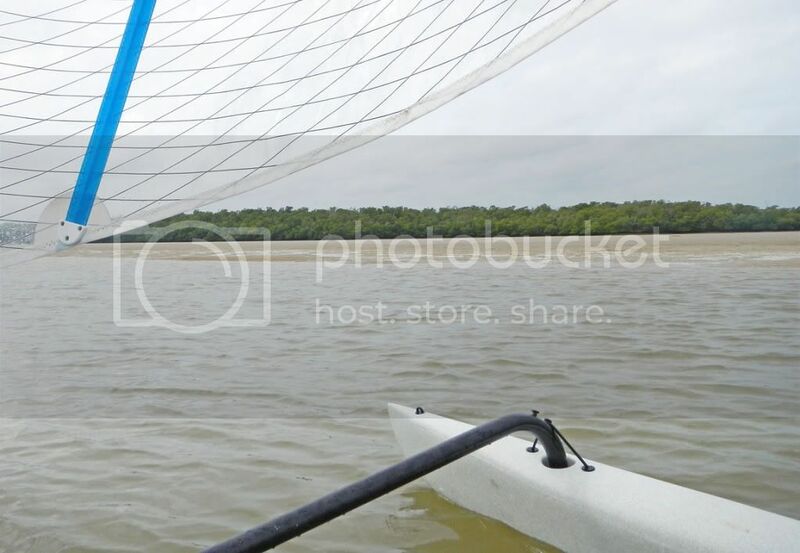 I am a “straight-line” kayaker. I don’t like to waste the time/energy doing the red or blue routes. Oyster bars. It is not low tide. At normal high tide, most of these oyster bars hide just under the surface of the water. 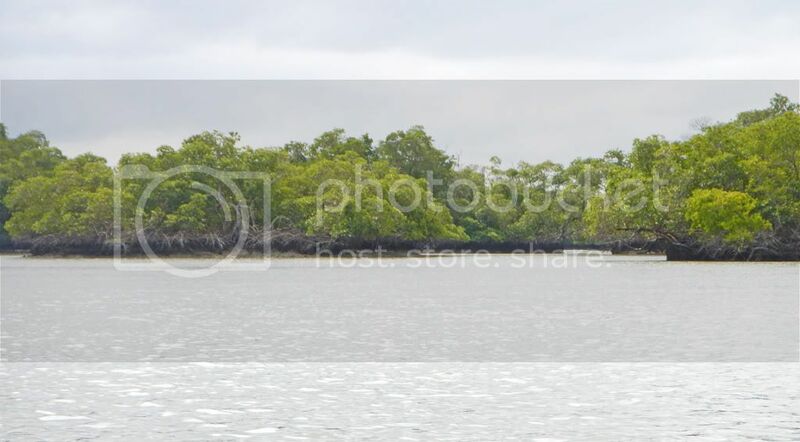 I hope you have enjoyed the trip from Chokoloskee Island through the pass to Pavilion Key. Pavilion Key is the “Crown Jewel” of the Everglades National Park. You should visit some time. Excellent, Keith. Thanks for taking the time to do that. That is a seriously cool and challenging trip, Keith. When you live on a small rock, even a nice one, you don't get to appreciate the feeling of driving (or sailing) in one direction for days without seeing the same things and people, over and over. 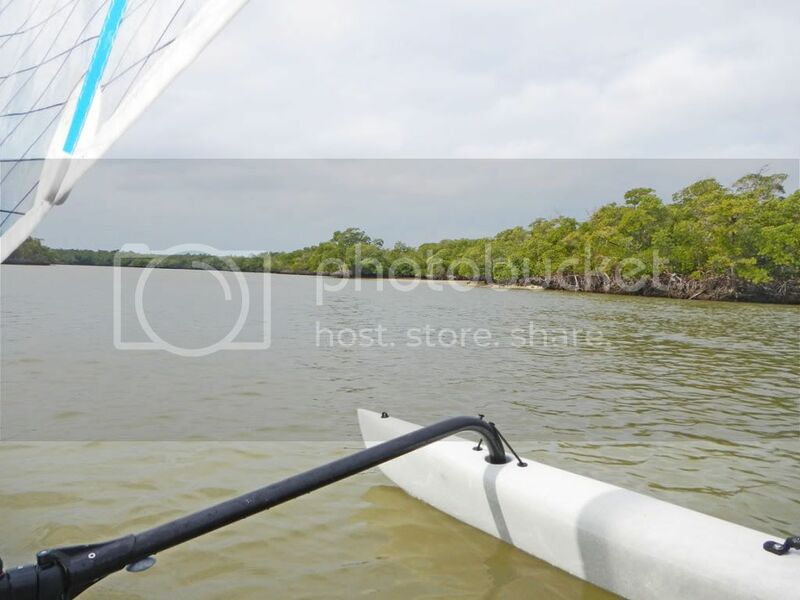 I think the Hobie 18 has finished. Dogslife has left Ckpt 2 in Chokoloskee, but he took the wrong route out to the Gulf. 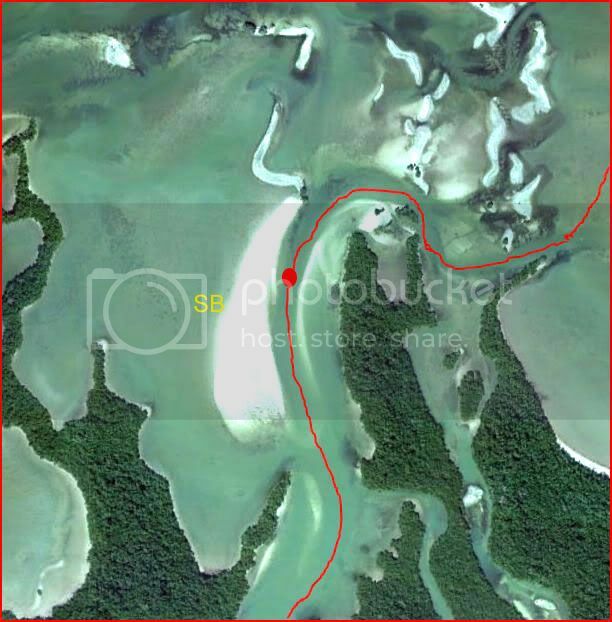 He has corrected himself, but has moved into a shallow area and will have to haul his boat across a sandbar before he is on the right track to the Gulf. Just checked the tracker and see Dogs is almost out to the Gulf. Dogs moves fast once he gets going. I think he is planning on coming in 5th in this race. AhMaChamee has made very good time this morning and is currently getting a permit to camp in the Park. Then he will head over to Ckpt 2. Backwaterbob in a Tandem has really made good time today, but is currently stopped where Indian Key Pass meets Chokoloskee Bay. I see he is moving now to the Ranger Station for a permit. TideTraveller (Josh) is a mile behind him in the Pass. All Hobies look good except for a tandem which has been stopped at the southern tip of Sanibel. They may be thinking of dropping. Another tandem is still further back and has almost certainly dropped. Oh, yes, I also saw that Dogslife had made a bad turn leaving Choko. I was glad it wasn't more problematic & was happy to see the SPOT showing movement again. This is a bit late in the camping season, but excellent timing for the fishing season. It is coming into the peak of the tarpon season. Gil Companioni and Yadira were on Pavilion Key last weekend and found tarpon rolling in the deep channel at the south end of the island. It would be great to get video of someone fighting a 100# tarpon. Redfish are in the area. So, a good chance of having redfish instead of our usual sea trout special. This trip is only for serious fisher persons and people willing to camp in possible adverse conditions. There may be serious storms about. And, if the winds die, we will all become steak tartar for mosquitoes and noseeums at sunrise & sunset. It will be hot mid-day. If you can put up with those potentially adverse conditions, this trip may be for you. Launch time from Chokoloskee on Thursday, Apr 12, will be a relaxing 10:00 am. We will return Sunday, April 15, at about 11:00 am—plenty of time to go to the City Seafood Restaurant for lunch before heading home. Prices for stone crabs should be off their tourist highs in case anyone would like to take some out to PAV the first night. They are a great meal on the beach when served with cold slaw, veggies, and French bread. I’ll pick up the permit. Let me know if you will be joining us. PS People coming out on the 13th, should plan to launch about 10:45 am from Chok. If you should come out on Saturday, the 14th, plan to launch from Chok about 11:45 am. when is the next trip. ready to get back out and down to do some fishing. We had the best fishing trip ever (I mean that literally) on Cape Romano on about Nov 12-13 several years ago. All fishing was done from shore. It was incredible. We tried to reproduce it in subsequent years with mediocre success. Still, Cape Romano is such a beautiful place, you can live with average fishing results. Even if the fishing were only half as good as it was that one time, it can still be good. The dates with good fishing tides are Nov 9-14. Nancy & I are up for a 3- or 4-day trip. What dates are good for you? I'm interested Keith and Josh. Any range within those dates works for me. Hi guys good to hear from you, we would love to join you. It's been a long hot wet summer. Return from Cape Romano: Leave between 9:00-10:00 am if we have enough water. It will be a rising tide. 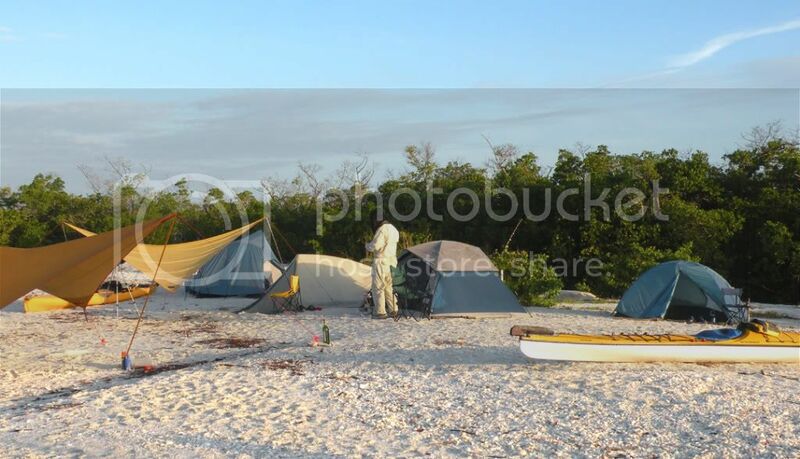 Cape Romano is a one of the premier, wilderness places in all Florida. It is only 6 mi south of Marco Island. We had one of our absolute best fishing trips there about 7 yrs ago. We tried to duplicate it since with mediocre results. Still, it is a great place to visit. Beautiful beaches. Here is a picture of our campsite in 2007. This beach is exposed to Gulf weather and can change dramatically from year to year. Please let me know if you are joining this trip via a post on this thread or email: kwellma at bellsouth dot net. Or call me at 305-666-4184. Sorry, Denise and I both have to work. We will have to catch you all on the next one. What are the plans for December? Anybody doing anything over Thanksgiving?